Paarl, part of Cape Town's Cape Winelands area, has a large area of unspoilt natural beauty at its doorstep. The Paarl Mountain Nature Reserve has a picturesque landscape of fynbos vegetation dominated by massive rounded granite rock formations set among wild olives, rock candlewoods and wagon trees. 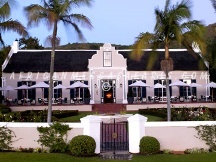 Below is a listing of Paarl accommodations in Western Cape - South Africa. To view complete details on the accommodation, click on "Read More+" under each hotel photo. Grande Roche is a celebrated international hotel, famous for its exquisite location in the heart of the beautiful Cape Winelands as well as for its luxurious, cosmopolitan accommodation, award-winning cuisine and matchless service and hospitality.The immaculately restored Cape Dutch homestead at Grande Roche dates back to the 18th century, and offers guests a variety of sumptuous accommodation.